The Wilderness Systems Ride 135 Kayak is a unique, pontoon-style hull offers unmatched stability for anglers. Stand up and enhance your visibility or increase casting distance with ease. From flat to surf to small water, the Ride 135 has the innovations anglers have been demanding, like the tool-less SlideTrax accessory system, the large rear tank well, a stand-assist strap, and the easy to access front and mid-ship Orbix hatches. Features the AirPro Freedom Elite standard seating system for comfort and easy adjustability. Every detail has been fine-tuned; from the wider, flatter standing platform, to beefed-up outfitting, to an intuitive layout that easily handles milk crates, all types of rod holders and gear in incredibly accessible locations. Limited number of 2018 closeout colors available, price applies only to stock on hand. To begin with, ACK was great to deal with and the Estes Express driver went above and beyond on my delivery. Kayak arrived in perfect condition. I switched to the SOT due to knee problems (I couldn't last more than an hour in my sit in). The Ride 135 has definitely cured my endurance problem. Very easy in/out, I am able to shift positions easily because of the great stability of this kayak.Easy to paddle, faster than I expcted and maneuvers quite well. Very happy with this purchase! I cant say enough about this kayak. It replaced an ocean kayak scrambler I used for years. It tracks great, I can easily stand in it. Plenty of storage. This being said its also much larger and heavier. With the rudder it gets close to 14 feet long so make sure you have a spot to store it. I have mainly used it on lakes and rivers but next month is our annual trip to Hatteras and I cant wait to get it out in the surf to see how stable it is. 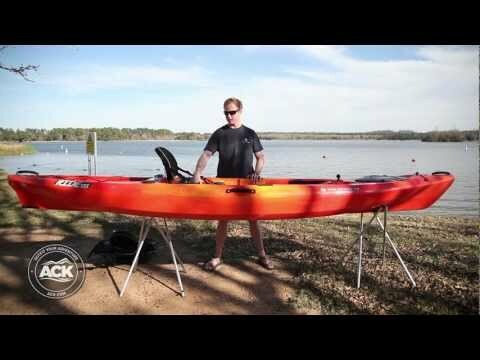 I am very new to kayaking, and was looking for a stable boat. Boy is this it. I have not only built up an extreme confidence in kayaking now, which includes standing up in the thing. The seat is incredibly adjustable and comfortable, as well as the immense dry hatches are great. The only reason there is not a full five stars up there is the weight of this boat. No 80 lbs is not horrible but it is a little ackward to carry, which also translates to a little slower boat on the water. My first impression when going out on the 2012 Ride 135 was how stable it was. Being taller and heavier then most people I was getting a wet ride on my OK Trident. After giving the OK to my son I went with the 2012 Ride 135 due to all the reviews and higher weight ratings. After two trips out I am very happy with the decision to go with the Ride. The room onboard is just incredible and the seat is very comfortable. The Ride is heavier then most and requires a little more effort to hoist up to my garage ceiling. It is also a little more trickier to get onto my kayak mount on my truck due to the pontoon style hull. I now use two pairs of Hullyrollers and ratcheting straps to secure it. Standard kayak tie downs were coming loose with this yak for some reason. The only thing I plan to add is a rudder in the near future. The redesigned 2012 Ride 135 is spot on! I am a 6'8', 240lbs and tend to carry a significant amount of fishing gear with me. The new Ride has handled everything I can throw at it and is the first kayak &quot;out of the box&quot; that fits me perfectly. It moves well in the water even under a full load. The seating system coupled with the floor layout is genius. The flat floor design actually allows me to stand up and sight fish and the seat is super comfortable and adjustable. I own/have owned quite a few fishing kayaks from WS as well as other manufacturers and I am truly pleased with how the new Ride performs. If you are looking for a super-stable, high capacity, durable, comfortable design that caters to the kayak angler, this is it.